Low Costa Mill Cottages01751 472050work Self-cateringLocated on the banks of Costa Beck, Low Costa Mill is set in a peaceful haven on the outskirts of Pickering, North Yorkshire. The ancient ‘Costa Beck’ dates back to the 1200’s & in times gone by this played an important part, powering the working mill wheel. Now it provides a relaxing setting for seven holiday cottages. With the feeling of being removed from a bustling modern lifestyle, the cottages are actually only 1.5 miles from the historic market town of Pickering and on the edge of the Yorkshire Moors. 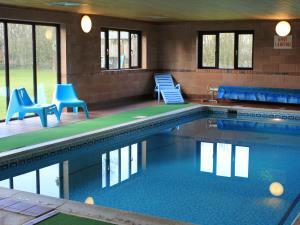 The on-site swimming pool is for the benefit of the cottage occupants only and provides many hours enjoyment for the kids. In fact combined with the climbing frame, garden games and woodland walk many of our guests spend the whole day without even thinking of leaving the site. Low Costa Mill Cottages offers weekly bookings starting on Friday and short breaks of 3 days starting on Friday and of 4 days starting on Monday in some seasons. Facilities for children: Cots available, Highchairs available, Stairgates available, Outdoor play area Children welcome from any age. Arriving at the Forest & Vale Hotel roundabout, the jct of the A170 and A169. Take the A170 through Pickering for about 1 mile (west), you will come to a large pond on the left. You need to take the next turning left after the pond, signposted to Marton. Go down this lane to the 1st crossroads and turn left onto a no through road. We are the 2nd mill on the left down this lane. There is a bus service from Malton Station to Pickering, but there is no public transport from Pickering to anywhere near Low Costa Mill (2.5 miles from Pickering). A car would be essential to enjoy the holiday.